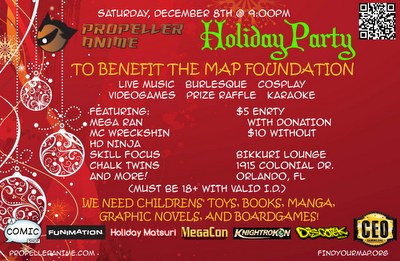 Propeller Anime: Tomorrow, We Party Hard For A Wonderful Cause! For $5 and a donation, you get in with a raffle ticket for a chance to win from an awesome selection of prizes. Stuff like weekend passes to MEGACON, HOLIDAY MATSURI, KNIGHTROKON, and C.E.O. GAMING or DVDs and BluRays from FUNIMATION and DISCOTEK! Plus swag from A COMIC SHOP! Not only that, we have MEGA RAN, MC WRECKSHIN, SKILL FOCUS: BURLESQUE, CHALK TWINS, HD NINJA, & FUNKY49 performing! 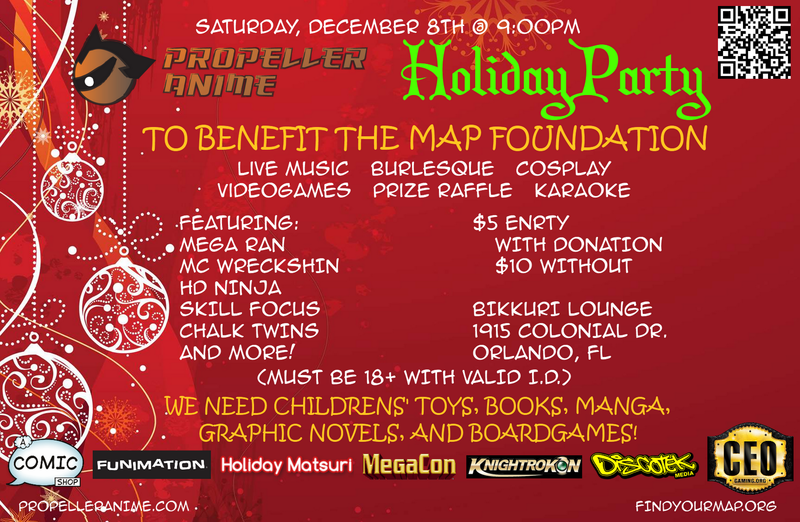 The best value, best entertainment, and best swag, and and all for helping benefit a wonderful cause with THE MAP FOUNDATION.